1. It’s an action-RPG in the style of SECRET OF MANA, developed in the West. 2. It was developed by a team of newcomers hired by a big developer! Brian Fehdrau, the lead programmer for the title, says in his interview with Corbie Dillard of super-nes.com that the team’s task was “to make an American-flavored Secret-of-Mana-like game.” Square had an interesting idea here: to create a Japanese-RPG-inspired game out in the West. The result is, in my opinion, a wonderful, quirky game. EVERMORE is visually and aurally a wonderful universe. 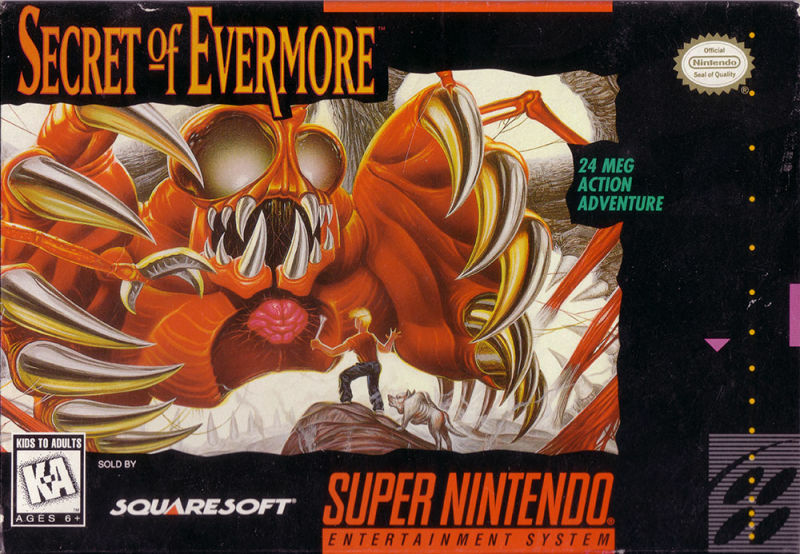 Compared with other SNES titles of the period, EVERMORE has a distinct muted look as it stays away from bright colors. Then 19-year-old Jeremy Soule created a soundtrack unlike anything before it for a game, and it remains one of my favorite scores today. Soule really created a sonic world for EVERMORE, taking sound design for games to a new level. In terms of gameplay, EVERMORE play similarly to MANA, as intended. The main difference is in the magic system: EVERMORE introduces the alchemy system. Ingredients, which can be bought or simply found lying around, are combined to create spells. Playable characters are also reduced to two instead of three. The game’s story is simple enough: a boy and his dog are transported to another world and must find their way back. This world is artificial, created by a scientist from the desires of three of his friends. So the boy and his dog travel through lands styled after prehistory, antiquity, the medieval ages, and the future. It’s an unusual take on a classic subject, and the game pushes it even further by having the dog transform in each land, eventually ending up as toaster dog firing laser beams of annihilation. The use of silly B movie references by the hero also adds a lot to the atmosphere and fun of the game! EVERMORE definitely isn’t Japanese, yet it isn’t entirely American or Western either. It’s a nice mix of the two, and what I personally believe is one of the first in a trend of “crossover” games, although the movie term isn’t quite a perfect fit. Other games in this trend are Amanda Fitch’s AVEYOND series and BLACK SIGIL (from what I have seen, this Canadian title would fit into this trend, although I have yet to play it).